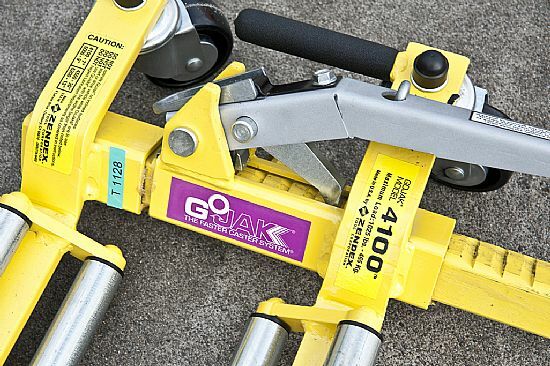 The GoJak 4100 is the perfect tool for self-loading smaller wheel assemblies primarily found on light aircraft. Unlike similar products designed for cars, the 4100 is lower to the ground with smaller castors which pull up closer together enabling it to pick up small aircraft wheels. The extreme angle of the handle allows for maximum clearance from body parts and spat covers. Hand operation also enables you to easily use directly under wings where pedal operation would be more difficult. Most products designed for cars use a foot operated system. The built in linear ratchet provides smooth and controlled lifting and lowering of tyres. The unit uses four x 3"inch (80mm) double ball raceway castors and is available in right and left hand configurations. LOAD RATING - The 4100 castor system can handle wheel weights up to 1025lbs on each unit, giving you a massive 3075lbs for each aircraft - assuming it has 3 wheels. TAIL DRAGGERS - The 4100 works with tail draggers too. WHEEL SIZES - The 4100 will accommodate tyres ranging from 7½ to 22 inches in diameter. TYRE WIDTHS - The 4100 will accomodate tyre widths up to 7 inches wide. AIRCRAFT WITH SPATS - The 4100 will work with most aircraft with spats due to its low profile and unique angled hand operated lever. SPEED - If speed is of the essence the GoJak 4100 is a no nonsence product. You can place the units around the wheels of an aircraft, lift and then move it in under a minute. WARRANTY - The GoJak 4100 has a limited warranty for a full two years from date of purchase covering factory defects in material and workmanship. GoJak® is a registered trademark of The Zendex Tool Corporation Designed, engineered, fabricated and tested in the USA; some components maybe sourced outside U.S.